Free Shipping Policy: Our free shipping policy is based on prepaid in full/credit card orders totaling over $100.00 in merchandise that are being shipped via Ground UPS within the contiguous United States. Same Day Shipping: On request we will ship online trophy and medal orders, completed with credit card payment before 1:00 pm Eastern Time (Mon-Fri), the same day. Excluded from the service are custom products (such as logos, custom ribbons,etc.) or unless otherwise stated. Processing times do not include time in transit - delivery dates vary depending on your location & method of shipping selected. Holidays are excluded from Same Day Shipping policy. Processing times do not include time in transit . 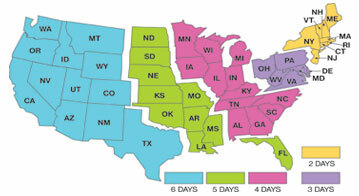 Delivery dates vary depending on your location & method of shipping selected. APO/FPO customers: All APO/FPO orders are shipped via Priority Mail (which takes 7-10 days to most locations) and the shipping charge will be 21% of the order total. Guam, Puerto Rico, & USVI customers: All shipping charges shown are approximate so your online order total may not be accurate. Alaska Customers: All Alaska orders are being shipped via 2- Day Air. Please be advised that some orders shipped via 2-Day Air may take 3 days to reach AK. There is an additional $15.00 shipping charge for AK orders. Hawaii Customers: All Hawaii orders are being shipped via 2- Day Air. Please be advised that some orders shipped via 2-Day Air may take 3 days to reach HI. There is an additional $15.00 shipping charge for HI orders. Dinn Bros. understands that most of our customers need their awards for a specific date. This is why we provide such detailed shipping information. We ask the date for which the order is needed so we can make sure the shipping method that you have chosen will ensure that you receive your order on time. The shipping days shown DO NOT include processing time. When choosing your shipping method, please keep in mind that neither UPS nor FedEx delivers on Saturday or Sunday. Ground UPS is not a guaranteed service. All orders shipped to HI and AK are shipped via 2-Day Air. Please be advised that some orders shipped via 2-Day Air to HI and AK may take 3 days to reach you. All orders to APO/FPO addresses are shipped via Priority Mail. The shipping charge will be 21 percent of the order total. Delivery dates shown on the order review page are by the end of the business day. Dinn Bros. requires a street address for all deliveries. We do not ship to PO Boxes. Free Shipping Policy: Our free shipping policy is based on prepaid in full or credit card orders over $100.00 in merchandise that are being shipped via Ground UPS within the contiguous United States. UPS Standard delivers in 2-8 days to most Canadian locations. Customs/duties and local taxes will be added upon entry into Canada and are the responsibility of the customer. Orders being shipped to Canada must be placed on a credit card. UPS Expedited delivers in 2-5 days to most Canadian locations. Customs/duties and local taxes will be added upon entry into Canada and are the responsibility of the customer. Orders being shipped to Canada must be placed on a credit card. Information regarding UPS Customs Clearance Rates may be obtained at the UPS website. Information regarding duties and taxes may be obtained by calling the Canada Border Services Agency at 1-800-461-9999. To obtain shipping prices for orders over $500.00, please add your items to our online shopping cart and the correct shipping charges will be shown at checkout - or contact our Sales Department at 1-800-628-9657 for further information regarding shipping orders to Canada. We will be happy to assist you! We use either Priority Mail (rates are roughly equivalent to 2-Day Air rates, takes approx. 10-14 working days and is not traceable) or Express Mail (rates are roughly equivalent to Overnight Air rates, takes approx. 3-5 working days and is traceable). Please contact our Sales Department at 1-800-628-9657 for further information regarding shipping orders to Guam. We use either Priority Mail (rates are roughly equivalent to 2-Day Air rates, takes approx. 10-14 working days and is not traceable) or Express Mail (rates are roughly equivalent to Overnight Air rates, takes approx. 3-5 working days and is traceable). Please contact our Sales Department at 1-800-628-9657 for further information regarding shipping orders to Puerto Rico. We use either Priority Mail (rates are roughly equivalent to 2-Day Air rates, takes approx. 10-14 working days and is not traceable) or Express Mail (rates are roughly equivalent to Overnight Air rates, takes approx. 3-5 working days and is traceable). Please contact our Sales Department at 1-800-628-9657 for further information regarding shipping orders to the U.S. Virgin Islands.